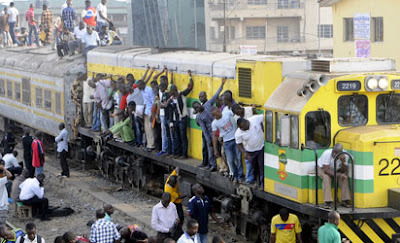 Yimiton's Blog: Train carrying over 900 passengers rammed into a trailer truck in Lagos. Train carrying over 900 passengers rammed into a trailer truck in Lagos. Over nine hundred passengers escaped death yesterday morning when a 10-coach Iddo bound train rammed into a trailer truck at Ilupeju Railway crossing near Oshodi, Lagos. An eye witness said that the articulated vehicle blocked the railway crossing when the train was already close by. The loaded trailer had crashed into the double barriers on the railway crossing shortly before the train arrived. On seeing the approaching train, the driver jumped out of the trailer and ran away. The train then dragged the truck for some distance, scattering the goods inside it — which were mostly empty cartons of Malta Guinness drink along the track. The dragging of the truck also led to the damaging of some vehicles parked along the rail track by motor mechanics. We gathered that the accident caused some damage to the engine of the locomotive and the track. Confirming the accident, Mr Ademuyiwa Adekanbi, the Lagos District Public Relations Officer of the Railways, said that no life was lost in the incident. God have mercy! It would have been disastrous! Oh my God, U read this post at all so? Them say NOBODY die! Abi, where 'rest in peace' for follow come? Picture from Teju Babyface's White Wedding. Ushering in the Ember Months. Happy New Month!